"We loved everything about the trip!" Discover the Red-Rose City "half as old as time!" Now, you will be thrilled with the spectacular red rock carvings of Petra, made famous through the blockbuster movie, “Indiana Jones and the Last Crusade.” Several movie scenes depict the 250-foot high narrow canyon sides with spectacular natural colored layers of sediment. One of the "greatest experiences of your life" commences with your flight connecting into Amman (Jordan). At Amman Queen Alia International Airport, after passport control, claim your luggage. Upon exiting luggage claim & customs, a 'PLAZA TOURS' representative will meet and assist you onto your transfer to the REGENCY PALACE HOTEL (or similar Superior Comfort Level Hotel) for the remainder of your stay in Jordan. An early drive will bring to PETRA. Here you will find yourself beginning to experience an adventure much like the movie, "Indiana Jones and the Last Crusade," where Indiana (Harrison Ford) discovers the coveted Holy Grail. It was filmed on location at Petra, helping to make it Jordan's most popular tourist attraction. 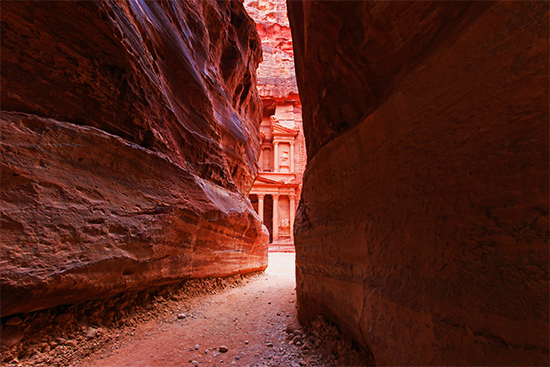 Petra, carved out of stone more than 2,000 years ago is hidden in craggy mountains. We reach it by horseback and by walking through a narrow defile or "SIQ" flanked by towering cliffs. The sudden view of Petra's most spectacular monument, the KHAZNEH or Treasury, is dramatic. Other monuments carved right into the multicolored-mountains are spread throughout the area. Following your adventuresome tour you will return to Amman. Optional HIGHLIGHTS of EGYPT or SPLENDORS of the NILE tours depart Amman this evening. After checking out of the hotel a PLAZA TOUR representative will meet departing guests and assist you onto your transfer. For those continuing to the ISRAEL REVEALED Holy Land Program, you will be transferred to a Jordan River crossing into the Promised Land. The lively red, pink and white colored sandstone walls draw you in to the stunning façade of a once royal tomb, known by the Bedouin as “Al Kazneh” or today, as the “Treasury.” Nearby, dozens of other tombs and carved artifacts add to the wonder of this “World Heritage” site. The site, once a thriving city, was established by Nabateans more than 300 B.C. Recent archaeological projects have uncovered remains of innovative networks of water collection, efficient water storage, distribution conduits, and irrigation systems. Petra became part of the Roman Empire connecting Jordan and Israel with the Northern Arabian Peninsula. Archaeologists suggest that up to 85 percent of its infrastructure is still underground. In December 1993, numerous Greek language scrolls of the Byzantine period were discovered in excavations near the Winged Lion Temple in Petra. The American Center of Oriental Research in Amman, Jordan is now researching the scrolls and artifacts to reveal life in Petra before its importance in international trade was interrupted by earthquakes and changes in trade routes. Petra reached its height by the close of Byzantine rule, around 700 A.D.